Cuba is poised on the brink of major changes as Fidel Castro enters his twilight years. Over the past decade, his regime has been actively promoting tourism as the island’s economic lifeline following the collapse of the Soviet bloc. Of course, Americans still find it very difficult to go, and President Bush’s tightening of the already stringent restrictions on travel to Cuba has not made things easier. But unlike their neighbours to the south, Canadians are free to visit this unique, fascinating, and accessible outpost of communism in the Caribbean, and have been doing so in great numbers for decades, especially as a way of escaping the cold winter months. While beach resorts like Varadero and the vibrant cities of Havana and Santiago de Cuba remain the destinations of choice for most, the opening of other areas of the country enables the curious traveler to explore hitherto lesser-known but equally interesting sites. Among these, one of the most attractive is certainly the beautiful colonial city of la Santisima Trinidad de Cuba, or Trinidad, founded by Spanish explorer Diego de Velazquez in 1513. Trinidad is located in the province of Sancti Spiritus in the central part of the country, in the shadow of the majestic Escambray mountain range, the second highest in Cuba, and close to the sandy beaches of the Caribbean coast. With the loosening of state controls over tourism, it is becoming increasingly possible for those interested in seeing the “real” Cuba as opposed to a packaged beach holiday to plan an individual itinerary focusing on a specific part of the island. Countless private casas particulares (the Cuban equivalent of the bed-and-breakfast) and paladares (small private restaurants, often run from people’s homes) are popping up everywhere, becoming popular alternatives to all-inclusive tours whose standardized approach to food and services can sometimes become monotonous and routine. Despite serious misgivings on Castro’s part that this might represent an unwelcome intrusion of private enterprise into his state-run economy, those Cubans able to open their homes to guests for meals or lodging have taken to the idea with enthusiasm. On recent trips to Cuba, we have found that the quality of food, comfort and personal service offered in the casas particulares and paladares frequently surpasses that available in government-managed hotels and restaurants. In addition, the experience of dining in a paladar or staying in a casa particular can bring the visitor much closer to the lives of ordinary Cubans who are living through an uncertain time of change and hoping for a better future. They are invariably welcoming to tourists, and enjoy exchanging views and impressions of the island and its thriving culture with them. Despite the continuing chill in relations with the United States, many Cubans working in the booming travel and tourism sector of the country’s economy speak fluent English. The citizens of Trinidad are especially eager to open their homes to travelers, knowing full well that their beautiful, unspoiled city and the surrounding area have much to offer. Despite its modest size, Trinidad probably has the highest concentration of privately run establishments catering to travelers of any city in Cuba. Trinidad makes an excellent base for exploring the nearby mountains, keys and beaches, but its most appealing feature is certainly the picturesque historic town centre. A gem of 17th-century colonial Spanish architecture, Trinidad’s focal point is the delightful Plaza Mayor, from which most of the town’s main attractions can be easily reached on foot. Like the old quarter of Havana, Trinidad’s central area was designated a UNESCO World Heritage Site in 1988, meaning that no new building can take place within its boundaries. Coupled with the fact that the town has only recently become an international tourist attraction after decades of relative neglect, the historic centre of Trinidad has remained remarkably unspoiled and well preserved. Walking along the cobbled, traffic-free streets, one can easily be transported back to colonial times, when the city emerged as an important trading post, and later the hub of the island’s booming sugar trade of the 18th and 19th centuries. The elegant plaza is composed of four formal gardens, with palm trees and statuettes framing each one. Surrounding it on one side is the Iglesia de la Santisima Trinidad, the town’s impressive main church, which celebrates masse every Sunday. 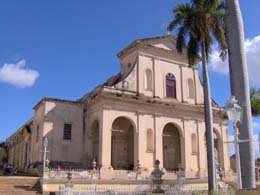 Since Pope John Paul II’s 1998 visit to the island, Roman Catholics and other believers in Cuba have enjoyed much greater freedom to practice their faith. Inside the church, one can find eleven ornately carved wooden altars. Flanking the other three sides of the Plaza Mayor are a number of beautiful colonial-style buildings, each painted in dazzling shades of yellow, white or pale blue, reflecting the bright rays of the morning sun. Among these are some of Trinidad’s museums, the Museo de Arquitectura Colonial, the Galeria del Arte, and the Museo de Arqueologia. While all of them are certainly worth a brief visit, the award for the town’s most intriguing museum must surely go to the wonderfully named Museo Romantico, located on the northwest corner of the Plaza, across the street from the church. Upon entering this museum’s magnificent interior courtyard, the visitor is immediately transported back in time to the heyday of Trinidad’s sugar boom and the comfort and affluence it brought to those who were enriched by it. Originally the residence the prosperous Brunet family, who made its fortune in sugar, this 14-room mansion dates from the early nineteenth century, and contains a remarkable collection of furnishings from that era. Moving from one well-appointed room to the next, the visitor is struck by the simplicity and beauty of the furniture and decorations, among which are an intricately-decorated Viennese bureau from the 18th century, a solid bathtub carved from a single piece of marble, weighing well over a tonne, a stunning formal dining room with a floor of Italian marble, and a master bedroom whose four-poster bed and French wardrobe were made without the use of nails or screws. Much of the furniture in the museum is made of Cuban mahogany, forests of which once dominated the countryside in central and eastern Cuba. Mahogany was much prized for its beauty and durability at the time, and a great deal of it found its way back to Europe where it was fashioned into magnificent pieces of furniture appealing to aristocratic tastes. The elegant front windows of the museum offer beautiful views of the Plaza Mayor and the surrounding buildings. Helpful guides in each room point out the most interesting features, and are obviously very proud of the wonderful collection of artifacts this museum houses. A visit to the Museo Romantico offers the visitor a glimpse of what life must have been like for a wealthy family living in Trinidad during the most prosperous period of its history. It also effectively captures the spirit of the early 19th-century Romantic era of European culture, transported to what must have been a remote outpost of that civilization at the time. For a small extra fee, it is possible to take flash-free photos of its splendid interiors. The day we visited, a rather rambunctious young Canadian child who was part of our tour group was darting dangerously from room to room, much to the anxiety of the custodians, who feared for the safety of a priceless Sevres ceramic piece precariously poised on a nearby pedestal! Just down the street from the Museo Romantico, one encounters a more recent and troubled but equally fascinating period of Cuban history. The Museo de la Lucha Contra Bandidos (Museum of the Struggle Against Bandits) is housed in a dome-topped yellow and white trimmed bell tower that has been adopted as the trademark image of the city of Trinidad. It is possible to climb to the top of the tower, from where panoramic views of the town and the surrounding mountains and seacoast can be taken in. This tower is part of what once was an 18th-century church and convent, and the museum now located in it deals with the struggle Castro’s infant revolutionary government waged against CIA-backed mercenaries operating in the nearby Escambray mountains during the first half of the 1960s. In the central courtyard a military truck and motorboat mounted with machine guns gives the visitor an idea of how violent that conflict was, before local peasant militia forces and regular Cuban army units finally subdued the revolt and consolidated the control of the revolutionary regime in the area. Perhaps the most moving room in the museum is the one containing a wall of photographs of those who lost their lives in the struggle. Many of them were young people, volunteers who had come from the cities to teach peasants in the countryside how to read and write as part of the regime’s massive literacy program, launched in 1961, and many of their faces portray a mixture of youthful idealism and innocence. The anti-Castro groups especially targeted these young teachers, who frequently paid with their lives for their selfless dedication. Whatever one’s opinion of Castro’s regime today, its ability to abolish illiteracy makes it unique in Latin America, and a visit to this museum leaves one with a powerful awareness of the high cost that was paid for that remarkable achievement. Trinidad has a number of other interesting sites that are worth a brief visit, but perhaps its colonial charm can be best appreciated just by strolling its narrow colonial streets, witnessing the life of ordinary residents going about their day-to-day activities. Many homes have birdcages prominently hung outside the windows facing the streets, and the delightful songs of canaries fill the morning air. A number of people have turned their homes into small stores, and a wide variety of handcrafts are on sale from their front windows, in particular the cool white cotton guayabera shirts that are now becoming popular with style-conscious men seeking to emulate the Latin look. There is also a small street market just off the Plaza Mayor, where a number of interesting items are on offer, including paper mache models of the 1950s cars that can still be seen plying the streets where they are permitted, many of which double as taxi cabs. Trinidad is well worth exploring by day, but the streets around the Plaza Mayor really come to life after sunset, when they echo to the sound of lively Cuban music, including the sounds of salsa, boleros, rumbas, and other musical forms the recent film The Buena Vista Social Club introduced to North American audiences. But prior to venturing out for an evening in some of the town’s main musical venues, we enjoyed a delicious meal in one of the town’s most famous paladares, called Sol y Son, situated a few blocks southwest of the main square. The owner of this private restaurant is justly proud of the beautiful interior courtyard where diners are warmly received, before choosing from an appealing selection of dishes including pasta, fish, chicken and pork, all prepared with care and served in generous, flavorful portions. On a recent visit, we dined there on two occasions, and were not disappointed either time. If all the tables are occupied, it is possible to sip a cool drink at the small bar at one end of the courtyard. The rum punch with fresh fruit is especially recommended, as are the two varieties of excellent Cuban beer, Cristal lager and Bucanero, a darker ale. Sol y Son is one of Trinidad’s first paladares, and its owner says she owes her establishment’s success to a number of French-Canadians who visited shortly after she opened, and enthusiastically passed the word on to other tourists. Now Sol y Son is recognized as the best place to eat in Trinidad, although there are also other attractive prospects within an easy walk of the Plaza Mayor. Fortified by this filling and tasty dinner, we strolled up to the square, and followed our ears to La Casa de la Musica (House of Music). Many Cuban towns have a nightspot carrying this name, but Trinidad’s is especially delightful since the evening concerts take place in the open air, at the top of a flight of stairs to the right of the main church. For a minimal cover charge, it is possible to sit at a table, sip a mojito or a Cuba libra, and enjoy the music as the tropical evening falls. The crowd, composed equally of tourists and locals, quickly gets into the spirit, and within no time many couples are dancing enthusiastically to the rhythmic Latin beat. Some of the young Cuban men take special delight in inviting shy foreign senoritas to dance with them, much to the amusement of the onlookers. 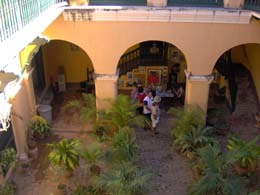 The music at the Casa de la Musica is very authentic and delivered with gusto, and once the group stops for its break, it is time to move down the street to La Casa de la Trova, another spot that features traditional Cuban music, this time in the interior courtyard of a colonial mansion. Again, the cover charge is minimal, and the entertainment changes nightly. The night we visited, a folk singer from Argentina entertained the crowd with popular songs from around Latin America, encouraging them to sing along with the choruses. Another option for live music is the restaurant called El Jigue, a block northwest of the main square, where a local band entertains diners after their meals. An evening stroll through Trinidad’s colonial streets can lead one to many other discoveries, as some clubs open only sporadically. But for such a small town, the range of musical options is truly impressive. For those whose musical tastes lean more to dancing to the disco beat, the La Ayala nightclub, located in a hillside cave, offers a lively program that continues well into the wee hours. Traditional Cuban folk dancing shows take place regularly in the courtyard of the Palenque de los Congos reales, a charming bar where one can also escape from the heat of a day with a refreshing drink. Whatever one’s taste in music or after-dark activities, Trinidad has something that will certainly appeal. Although we stayed in one of the larger beachside tourist hotels a few miles outside the town on the Ancon peninsula, for our next trip we will probably book into one of the casas particulares in the town itself. There are many to choose from, and information and booking procedures about some can even be accessed on line. Because of the government’s somewhat ambivalent attitude towards these examples of flourishing private enterprise in Cuba, it is sometimes difficult to find a particular paladar or casa. They are not permitted to advertise conspicuously, so having a specific address in hand is probably the best way to find one. Local taxi drivers can also be helpful with this. Beyond Trinidad there are countless options for interesting day excursions that can be booked locally. For those who crave the beach, the mile-long sandy stretch of the Playa de Ancon, a short taxi ride from town, should fit the bill. The beach itself is open to the public, but anyone wanting to enter one of the hotel complexes that front it must be a registered guest. If one walks a bit beyond the hotels, it is possible to find a deserted area where the sand is fine, the water is warm, and the scrub vegetation of shrubs and trees descends practically to the shoreline. From the small marina at the tip of the Ancon peninsula, it is possible to book a diving or snorkeling trip to nearby Cayo Blanco, a narrow strip of land about five miles off shore, with a coral reef where schools of parrotfish, trumpet fish, and moray eels can be seen swimming in the clear blue waters. The trip includes a lunch stop on the beach, where a delicious meal of lobster, shrimp, and saffron rice is served to hungry snorkelers. Cayo Blanco is uninhabited, and the only local one is likely to meet there is a very tame iguana. Anyone interested in a hiking trip to the nearby Escambray range should consider a visit to the Topes de Collantes National Park, where both easy and more challenging treks through jungle paths are available. At almost 4000 feet, the Pico de San Juan is the tallest mountain in the area, and is easily visible from the road. The journey to the mountains is best taken by taxi, since the narrow, twisting roads and hairpin turns make it impossible for buses to make their way. It is also possible to book a day trip on a cumbersome but sturdy vehicle with an open top that probably once served as an armoured troop carrier! While the ride can be bumpy at times, the views of the lush green mountains, plunging valleys, and sweeping seacoast as one makes the slow but steady ascent are truly breathtaking. Upon arriving at the small hotel-camping complex that acts as a reception area, the tour guide leads hikers down a narrow jungle path leading to a spectacular waterfall hidden in the middle of a pine and eucalyptus forest. The hardy adventurer can swing, Tarzan-style, from a hanging vine, or plunge into the icy waters of a small pool at the bottom of the cascade. From Trinidad, it is possible to book a taxi that will take you all the way to Santa Clara, the largest city in the province, and home to the impressive monument and mausoleum-museum dedicated to Ernesto “Che” Guevara, the Argentinian-born guerrilla leader and hero of the Cuban revolution who died in Bolivia in 1967. Che’s remains were discovered three decades later where they had been hastily interred and returned to Cuba for a solemn reburial in Santa Clara, at a ceremony attended by Castro and other leading government figures. Che has a special place in the history of Santa Clara, since it was here that his rebel band that knocked a train full of army regulars loyal to the dictator Fulgencio Batista out of commission on New Year’s Eve, 1958, enabling him to seize the town and open the way for the triumphal entry of Castro’s rag-tag rebels into Havana a few days later. The derailed train and the bulldozer Che’s men used to halt it are still on view at a small outdoor monument on the outskirts of the city. Che is a major icon throughout Cuba, and the government has capitalized on his international status as a revolutionary celebrity to market his image on t-shirts, cups, posters, key chains, and even towels. It is possible to purchase dozens of postcards of Che portraying different stages of his career. 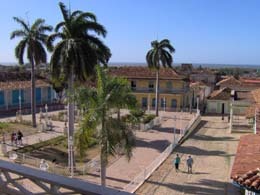 But besides the museum dedicated to him, and its most impressive feature, the monument itself, topped by a colossal statue of Che, Santa Clara has many other attractive sites to visit, including the beautiful Parque Vidal, the town’s central square, and two interesting buildings facing it. The Teatro de la Caridad is one of Cuba’s best-preserved 19th-century theatres, with an ornately painted ceiling and a three-tier balcony. Recently restored to its full fin-de-siècle grandeur, it is certainly worth a stop. The Museo de Artes Decorativas (Museum of decorative arts) contains artifacts from different periods of Cuban history, focusing mainly on the 19th century. A good paladar where a delicious lunch can be obtained is the Casa Cuba, just south of the Parque Vidal. The day we visited the special was calamares a la plancha (barbequed shrimp), and we enjoyed a huge plate accompanied by rice (a staple of Cuban cuisine) and salad for a minimal price. Trinidad and the region of Cuba that surrounds it have been recently discovered, and are both becoming popular destinations with Canadian tourists and the increasing number of Europeans who are opting for individualized as opposed to package trips. As the Cuban government continues its process of promoting tourism and permitting more accessible travel throughout the island, this trend is likely to become even more popular. While for most Canadians, a holiday in Cuba generally means a week at the beach with a short side trip to Havana, sites like Trinidad, so rich in history, scenery, food, music, and culture, are likely to attract even more travellers in the years to come. La Santisima Trinidad de Cuba is surely the jewel of the Escambray, well worth a visit for a few days or an even longer stay to explore this fascinating part of Cuba. Useful websites include the following. Peter Flaherty is a much-travelled teacher who specializes in history, Canadian Studies, politics, and philosophy. He has published numerous books and articles, has been a candidate for the Parliament of Canada and teaches history and cultural courses in Italy in the summer months.